This site contains information on the now-obsolete Control Data 6000 Series mainframes. ("60bits" comes from the word size of these computers.) See my main website for more information. Interest in CDC mainframes has increased recently, with the 2002 release of Desktop Cyber, an excellent software emulator of these 1970's vintage mainframes. There is a password-protected website containing copyrighted Control Data software and documentation that is available to non-commercial users who have signed an agreement with BT Consulting (which was formerly known as Syntegra and is what is left of the once-mighty Control Data Corporation). Access to this website is restricted to people who have something to contribute. See the instructions on the website if you want to join. There's also cray-cyber.org, which runs a real Cyber and a real Cray for hobbyist use over the Internet. For the time being, this site is primarily a repository for historical documentation which is not copyrighted by CDC, and therefore does not need to be on a password-protected website. The emphasis is on Michigan State University's obscure SCOPE/Hustler operating system. See the notes below on PDF formats. News: SCOPE/Hustler is now running on DtCyber! Interactive mode is available via a port of FREND. See the frend2 SourceForge project. These documents were written for MSU systems programmers or hardware engineers--a very limited audience. 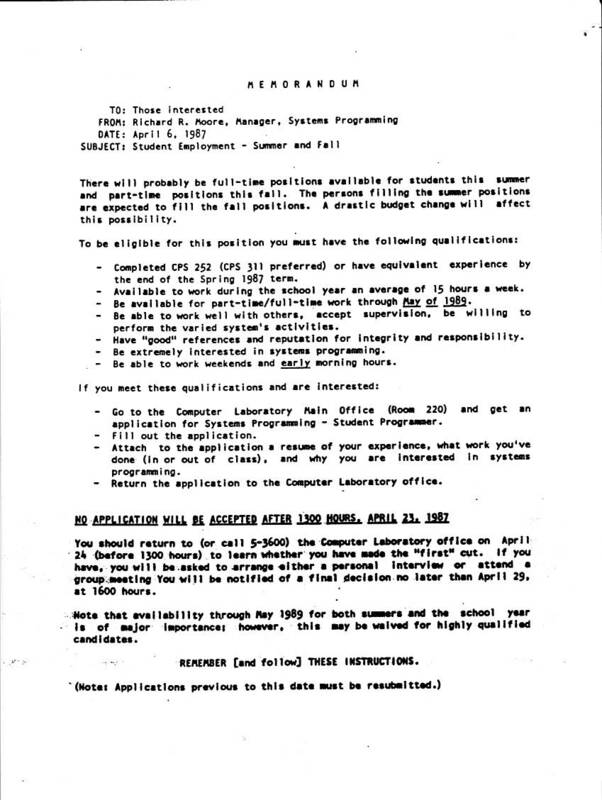 MSUInteractiveSubsystem.6SM135-1.1979.pdf describes the inner workings of SCOPE/Hustler's interactive subsystem, with an emphasis on MANAGER, the dedicated mainframe CPU control point program. FREND.6SM124-1.1980.pdf describes the inner workings of FREND, the operating system for our Interdata 7/32 communications front-end. 1FP-CP2TT-AndAssociatedRoutines.6SM134-1.1979.pdf describes the mainframe software that interfaces between the front-end and MANAGER. SCOPEHustlerConsoleGuide.html is a user's guide to the console, written for systems programmers rather than for operators. STRAPS.pdf is the Systems Tasks, Responsibilities, And Procedures written as an employee manual for systems programmers at Michigan State University. It contains a lengthy coding standards document, as well as several other documents outlining how to process trouble reports, how to behave in the computer room, etc. This is a text-based PDF. Whoops, here's the missing page 4 from STRAP 12.
l-sys-doc.zip contains the HELP documentation for the L*SYS library used by systems programmers, in both Microsoft .CHM format, and one large ASCII text file. l-sin-doc.zip contains the HELP documentation for the L*SIN library used by Systems INtegration group inside the Systems Programming unit. As above, it's in both Microsoft .CHM format, and one large ASCII text file. The utilities and batch files described here were of interest only to those few programmers charged with building the operating system for a new release, and hence are quite obscure. SCOPEHustlerRM.65202h.1981.OCRTextUnder300.pdf (19.45 MB) is the main reference for SCOPE/Hustler. SCOPEHustlerInteractiveSystemUsersGuide.65004k.1981.OCRTextUnder300.pdf (10.85 MB) describes how to use the system interactively, and includes complete documentation on MSU EDITOR. This and the SCOPE/Hustler Reference Manual above constitute the essential user documentation for the operating system. l-unsup-doc.zip contains the HELP documentation for the "unsupported" library L*UNSUP, in both Microsoft .CHM format, and one large ASCII text file. L*UNSUP was a software library maintained by Computer Lab User Information Center, based on contributions from the consultants and a few ordinary users. In contrast, the OS and officially supported utilities were maintained by the Systems Programming unit. MSUAPLIBManual.pdf (1.5 MB) describes APLIB, a SCOPE/Hustler-specific archive utility primarily used to store files on tape. 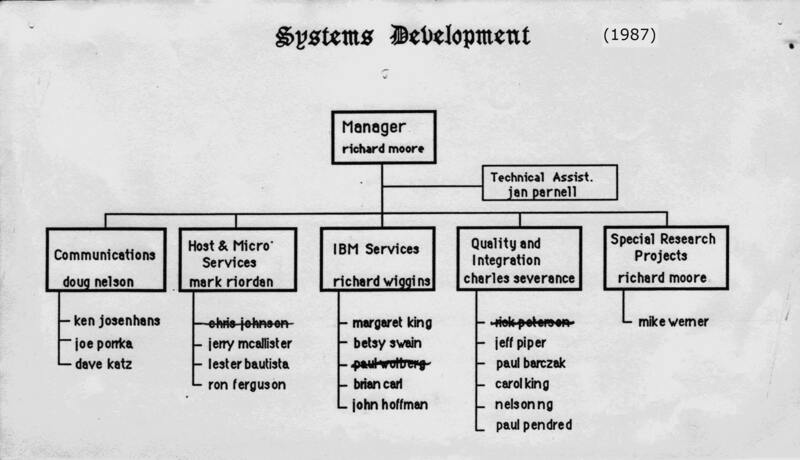 SysDev87.jpg is the organization chart for Systems as of 1987. JobPosting87.jpg is the annual job posting for Systems students, for the Systems class for 1987. I have uploaded a modest collection of MSU source code. Here's a detailed SCOPE/Hustler deadstart walkthrough, as well as downloadable disk pack files for running SCOPE/Hustler under DtCyber. CDCTap.zip contains a program to process ".tap" files in various ways. The ".tap" format is a more-or-less standard format for reading old 9-track tapes into modern byte-oriented files. CDCTap can do an octal / Display Code / ASCII Fancy dump of a tape. If the tape is an MSU PFDUMP tape, it can also do a PFLIST or PFLOAD. Public domain; includes C++ source and Win32 .exe. MSUEDList.zip contains a program I wrote to read MSU EDITOR workfiles, assuming they are on your PC hard disk stored as 1 CDC 60 bit word per 64 bits (as created by CDCTap). Public domain; includes C++ source and Win32 .exe. Most of the documents here are in Portable Document Format (PDF), which can be read by Adobe Reader. Many of them have been processed with the Optical Character Recognition (OCR) program FineReader, with the unusual option of hiding the text underneath bitmaps of the original pages. Thus, when you view the pages, you'll see the original page images; you will not be subjected to any inaccuracies of the OCR program. (Though FineReader generally does a very good job.) However, you can do searches on the text using Abobe Reader 6.0's Search feature. You will see all occurrences of the text in the document, in context. As with all PDFs, I recommend that you right-click and choose "Save Target As..." (or the equivalent), rather than left-clicking on the filenames below. The "OCRTextUnder300" portion of the filenames means that I used FineReader's "Text under the page image" feature, with a bitmap resolution of 300 dpi.